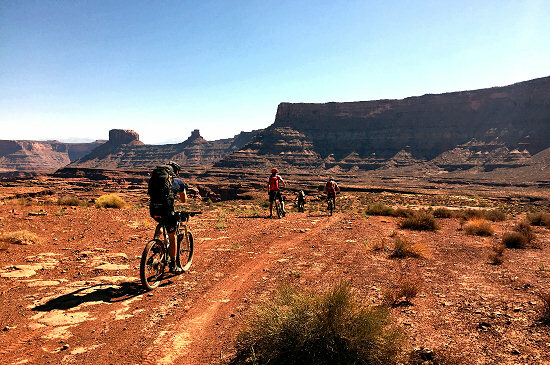 …terrain Utah can serve up. Remote is a word that barely scratches at the surface of describing this combined mountain and desert landscape. Starting high in the mountains, riders are treated with cooler temps, the pungent smell of pine, and the sound of the breeze in the trees. 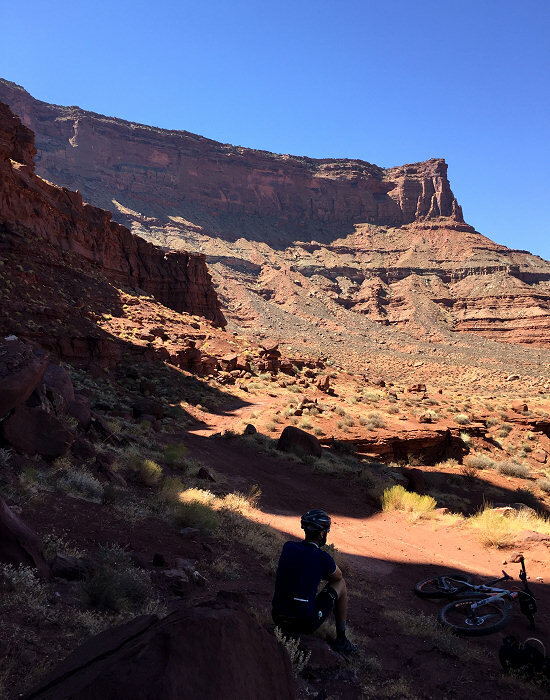 After pedaling alone the alpine roller coaster of the Abajo Mountains, riders rocket out of the mountains on a massive descent to find themselves riding alongside the weird, warm, and wonderful landscape that is quintessentially Utah’s Canyon Country. The riding on this tour is comprised of rugged jeep roads with only few short and walk-able exceptions. This tour is suitable for intermediate to advanced mountain bikers. 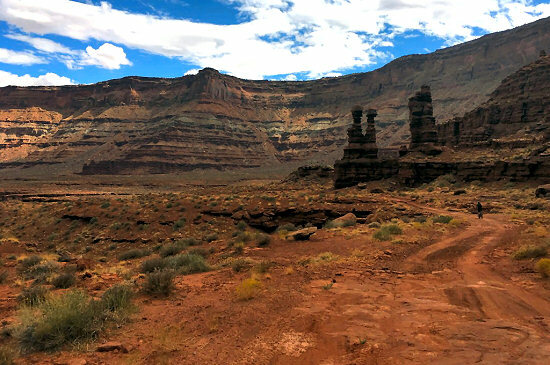 NEWS: On December 27th, 2016 much of the terrain that our Trans-Utah MTB tour passes through was declared the Bear’s Ears National Monument by President Obama. 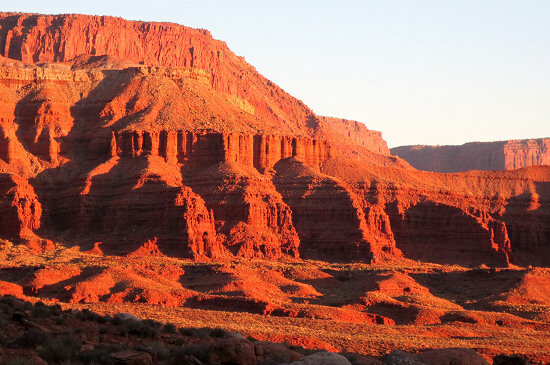 This is a magnificent region of redrock cliffs, mysterious canyons and stone silence. YouTube – Celebrate Bears Ears: Welcome to our New National Monument! 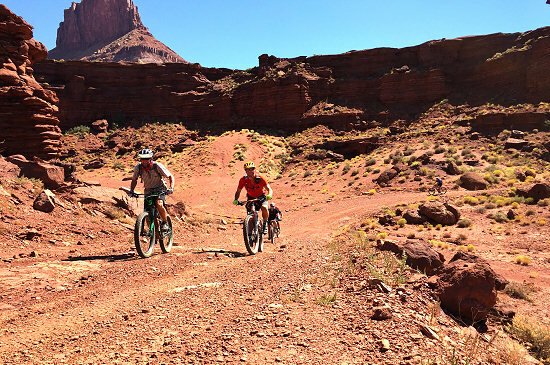 NOTE: The Abajos Mountains to Moab MTB Tour meets on the day prior to the trip start date. Tour Cost: $1,250 per person. Group discount of 5% for groups of 4 or more. Please see our Tour Discounts Policy. Tour Includes: 4-days of guide service, all meals, forest service fees, energy food, liquid refreshments, shuttles and mechanical support. Alcoholic beverages, bike rental and massage are additional. Bike Rental: $200- for a 2019 SCOTT Genius 730 full suspension, Riders can of course use their own bikes. 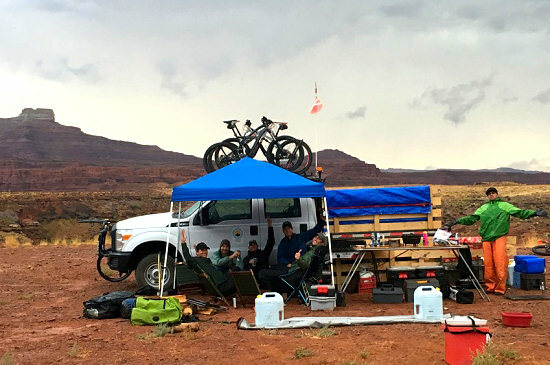 Rental Tent, Ground Pad and Sleeping Bag: $85 – Lizard Head Cycling offers late model camping gear rentals. The rental tent is a 3-person Sierra Design tent (sleeps 2 comfortably). The ground pads are 1.5 inches thick and our synthetic sleeping bags are rated for 20 degrees (so you’ll feel warm & comfy in the wilderness). **Al la Carte tent rental is $55. On Day 0 (the day prior to the tour start date) we meet in the late morning at the Courtyard Marriott in Grand Junction, Colorado. 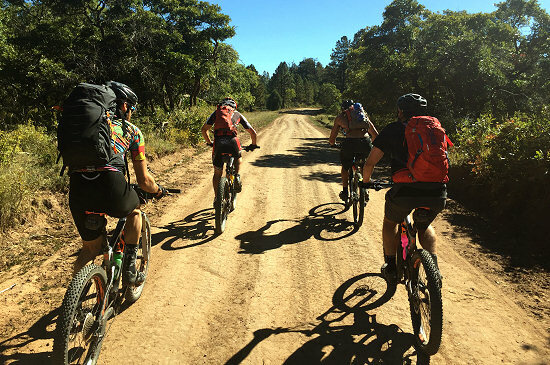 At the tour meeting we will go over gear, fit bikes and then shuttle in to the field to meet the group and camp tonight on the edge of the Dark Canyon. En route, we’ll stop at the Peace Tree Juice Café for a smoothie stop. 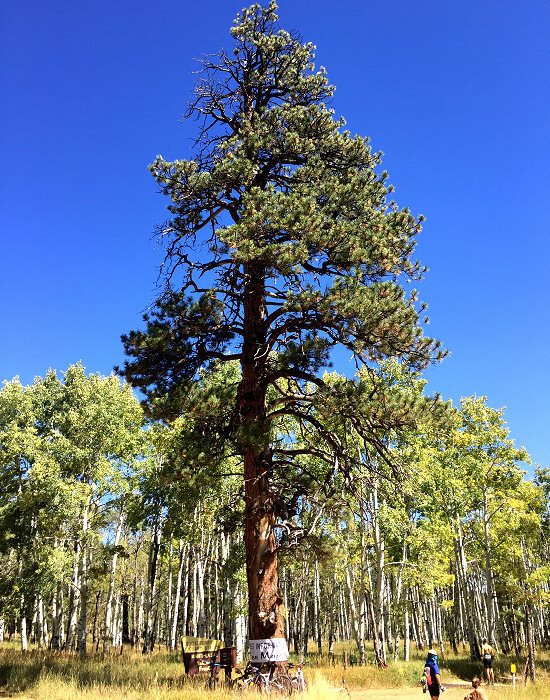 From the edge of Dark Canyon the route ascend upward into the Ponderosa Pines of the Sierra Abajos. The transformation of vegetation on this day is remarkable. Our route climb finishes atop of Elk Ridge, a high plateau in the mountains. From here we duck in to the shelter of the trees where riders are greeted with post-ride hors d’oeuvres, beverages and a warm fire. 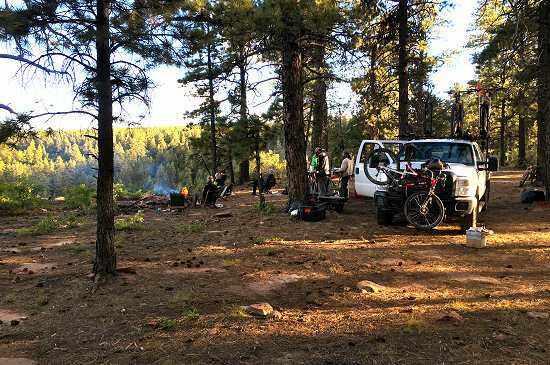 After a mighty coffee call that echoes through the forest trees and a hearty breakfast, we’ll saddle up for a massive day of descent (over 4,000′) out of the mountains and back into the desert. On the way we’ll stop to look down into the Needles District of the Canyonlands. 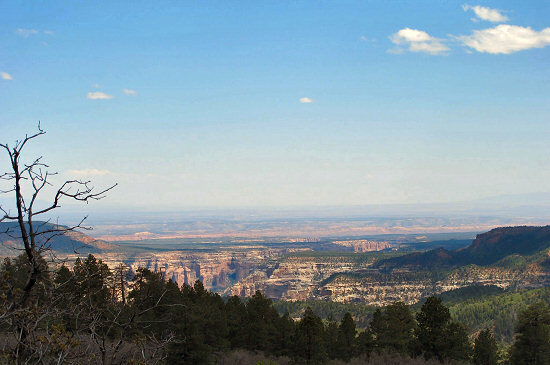 As we continue to descend, the Ponderosa begin to give way to desert Junipers and Indian Paintbrush. 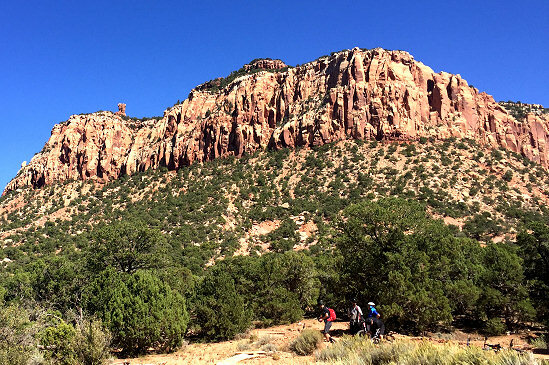 The route begins to taper off about 30 miles in and at this point Six Shooter Peak and the massive walls of Indian Creek will reveal themselves – the splitter cracks in these walls attracts rock climbers from all over the world. Our route travels briefly along HWY 211, the only pavement our mighty steeds will see on this tour, before heading north into Lockhart Basin. 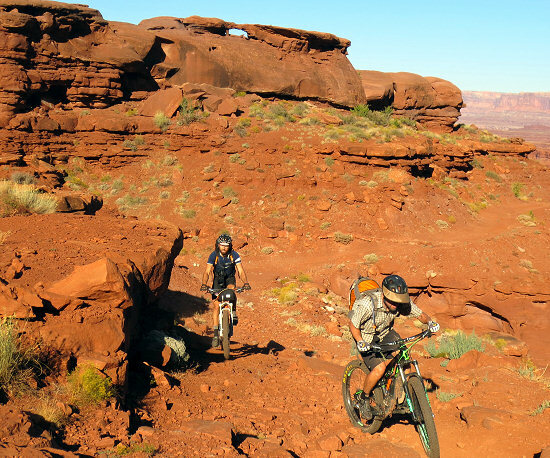 From here the riding slowly transforms into fun sections of slick rock and a number of washes. We’ll camp with the Needles overlook towering above us and the Abajo mountains from where we just came off in the distance. And if the evening is clear, we’ll see stars in ways that some will never experience. In the morning we’ll wake up to a coliseum of glowing orange rock and blue sky. Today’s ride, while having the least amount of vertical gain and loss, does offer the most exciting riding. The ride is not overly technical, but it is LOTS of fun. The rollercoaster-like road dives, dips and climbs alongside a cliff band that parallels the Lockhart Canyon and the Colorado River. The few short technical sections will pose a formidable challenge for riders of all ability levels, but are also short in duration and can be easily walked. 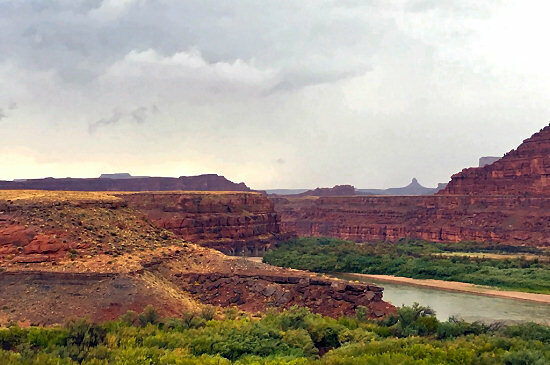 The White Rim trail can be seen across the river, but with as much excitement and as little traffic as Lockhart provides, you’ll quickly understand why this route is our little secret. Just before the final miles of the ride, the hardest section, known as the keyhole, provides some of the best riding on the tour and ensures that very few vehicles are able to go where we just biked. 🙂 Being that the same is true of our support rig, we’ll say farewell in the morning and plan to meet the mothership again in camp. Tonight’s camp sits directly above the east side of the Colorado river and, when conditions are appropriate, a fantastic dip provides the perfect way to wind down the day. That’s the name of the pass we must overcome before our tour comes to a close. After an energy packed breakfast, we’ll say goodbye to the Colorado River and enjoy a few more cruiser twists and dives before arriving at the base of the day’s biggest challenge. The 1000′ ascent of Hurrah pass is short, but plenty challenging and exposed with big views looking down onto the Colorado River and one of Utah’s major solar energy projects. The summit can actually be a bit chilly, and as such we’ll only stay long enough to snap a few photos before starting the big descent down the other side. After descending this massive hill, many riders think they are scott free, but one last 300′ hill ensures that riders will have more than earned the super scenery along the way. 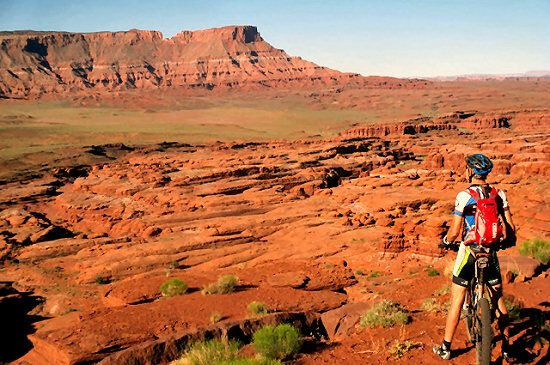 The finish line is the Moab Brewery parking lot. Here we’ll have a hearty lunch and a couple of celebratory brews. 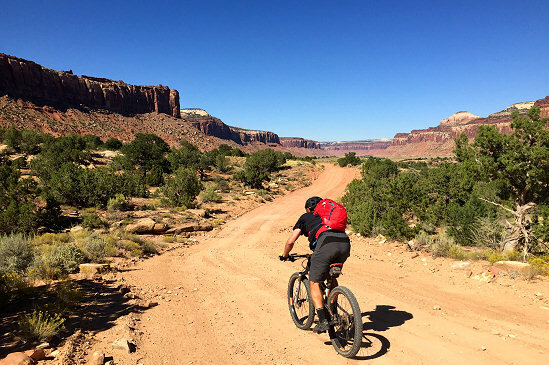 Post-Tour Logistics: The Abajos to Moab tour ends in Moab where we enjoy a celebratory brew or two at the Moab Brewery and then a farewell dinner out on the town in Moab. NOTE: Guests are responsible for their own post tour lodging in Moab. 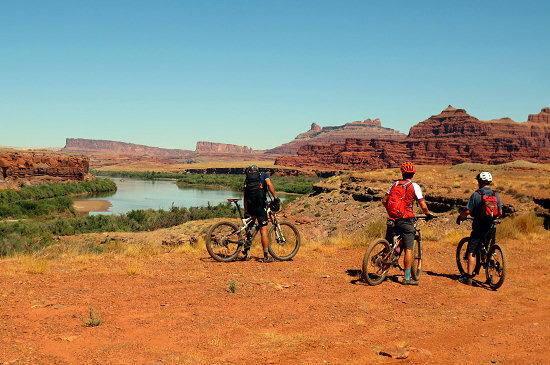 Lizard Head Cycling recommends the Quality Inn located near the Moab Brewery. Meals: Guides in camp will prepare all meals. 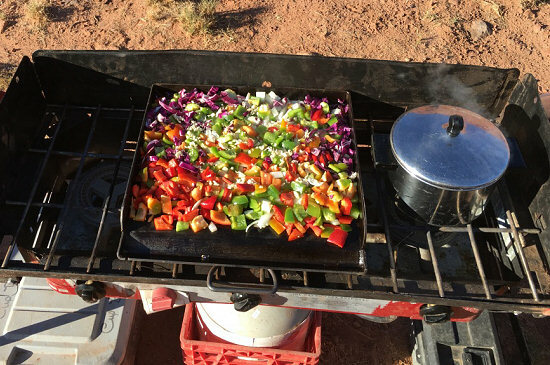 Meals include: Dutch oven lasagna, wild salmon, grilled chicken, salads, quinoa, fruits and lots of seasonal veggies. Any dietary preferences or allergies should be noted on the registration form. Each of Lizard Head Cycling’s lunches contains gluten free options. Ride Difficulty: This custom tour is designed for Intermediate/Advanced cyclists with various levels of fitness. Each day there are additional mileage options for advanced riders. Tour Support: An off-road vehicle that carries luggage, food and equipment will support this tour. On the remote singletrack trails cyclists ride with their lunch and water in their packs.